Just a quick post tonight to share a card I made yesterday for 2 challenges. The evening got away from me, so I had to wait until tonight to post. Those weekends go SO fast. I made this card for one of my very special Aunts. I think she'll like it! I didn't have any natural light to take these photos, so the burgundy looks a bit washed out. It's much richer in real life. I did a lot of layering and embellishing on this card. And it was fun. Lots of fun! I'll list my supplies below. Gotta go. Absolutely stunning!! I really like the sewing theme with the buttons, stitching and that sweet little thread spool! Thanks so much for playing along with CR84FN! Susie, ADORE the spool for the center of the bow! LOVE the pom pom trim, too! Wonderfully Pretty card! THX for playing with us at CR84FN! Beautiful card! I love the vintage look. 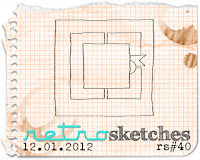 Your card is so stunning I came from Retrosketches to have a look. Great card - I hope you'll link up at 52 Card Pickup this week! Dang...I understand...WEs go waaay to fast! 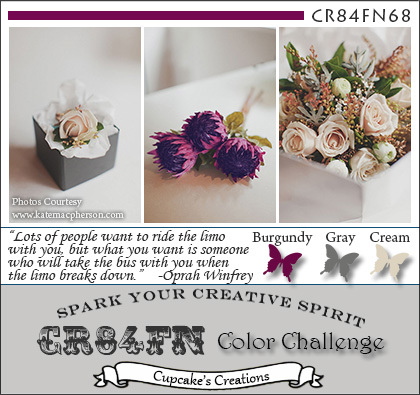 Love the button card and how you used for both buttons and stamps!! Pom pom trim and spool look wonderful! 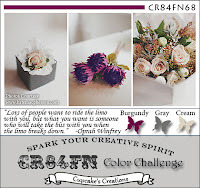 Thanks for joinig the CR84FN challenge! Your aunt is gonna love this card!! I think it is gorgeous! Love the buttons and especially the little spool in the bow! Thanks so much for playing with us at CR84FN! Oh I never thought to use the button card for ornaments, it's sooo adorable! Love the stitching and the little spool...a perfect homespun card! Susie this is gorgeous! WOW! Thanks for playing along at Retro Sketches! Thanks for joining us at CR84 FN this week!